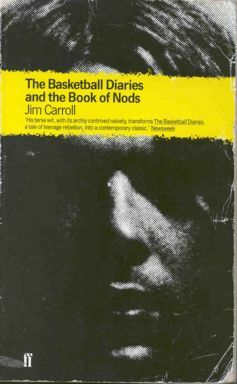 This unique British paperback reprints The Basketball Diaries and the prose poems of The Book of Nods. The back cover blurb reads: "Jim Carroll is tough, streetwise. Schoolboy basketball hero and youthful drug addict, his diaries are razor-sharp, funny and unforgettable, The Basketball Diaries, written in the 1960's, is now an American classic. The prose from The Book of Nods, included here, confirms Carroll's reputation today as an uncompromising writer who possesses a rare and acute sensibility." It also includes quotes from Jack Kerouac, Patti Smith, and William S. Burroughs. The cover photograph is a closeup crop of the original cover photo by Rosemary Klemfuss/Carroll. Thanks to Kevin Opstedal for sending me the cover art and details. Thanks also to "Catty" for reminding me!